and get this rockin’ CD as a bonus! “From the Heart” is a new and unapologetically old-school CD (shrink-wrap, yo!) on which stars of the Jersey club scene have joined forces for a vital cause. The CD benefits Steven’s Walk, a charitable organization named for a brave young man called Steven Potter. (My brother, Brian Voger, who spearheaded this project, is a Potter family friend.) Steven’s Walk raises funds and awareness in the fight against the insidious disease Spinal Muscular Atrophy. SMA is the leading genetic cause of infant death, and robs sufferers of their mobility and their lives. 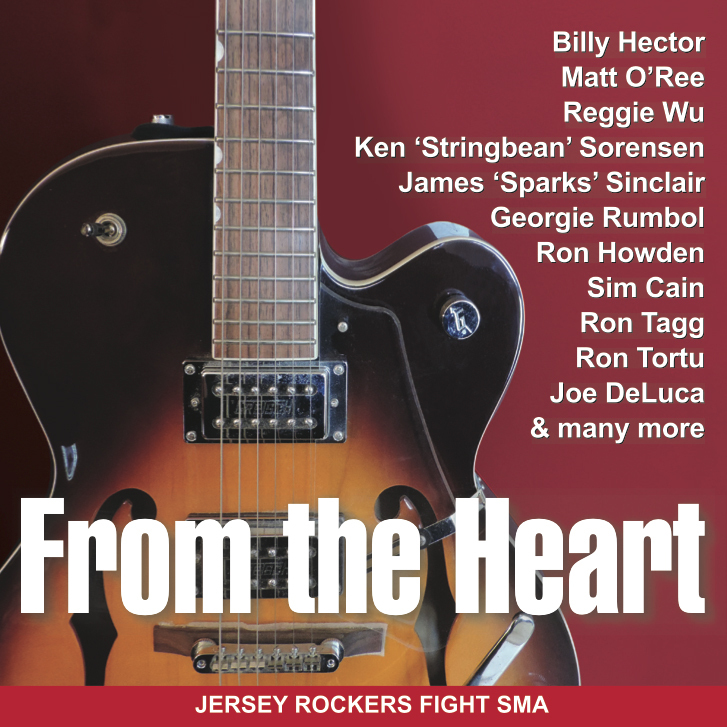 Anyone who knows the Jersey Shore and South Jersey club scenes will recognize the names Billy Hector, Matt O’Ree, Reggie Wu, Sim Cain, Ken “Stringbean” Sorensen, Georgie Rumbol, Ron Howden (Nektar, yo! ), Ron Tagg, Ron Tortu and Joe DeLuca. In all, 20 musicians graciously contributed. We launched the CD at the May 9, 2015, Steven’s Walk in Collingswood, N.J. (It was the final live event for Steven’s Walk, as Steven prepared to enter college.) It was a beautiful, fun, upbeat event with wonderful people. Honestly. As soon as we pulled up with our boxes and signs, we were besieged by volunteers who said, “Can we help?” I met Steven and some of his friends who are living with SMA. It was edifying. This is one hell of a fight these kids and their families are waging. Their grace and strength is an inspiration. They could use your help. So get on Vogerland, buy the CD, and know that every penny of your 10 bucks goes to an important cause. Our goal is to raise $10,000 — 10 bucks at a time. So like I said: “From the Heart” is a keepsake. Stick it on yer mantle and remember the good old daze. Brian and I were guests on “The Electric Ballroom” — a rock ‘n’ chat show on 95.9 WRAT-FM hosted by Keith Roth — to talk about “From the Heart.” Read the interview HERE. Brian put the audio on his website, which includes nice, crisp versions of seven “From the Heart” songs. Listen to the interview HERE. NJArts.net, an invaluable go-to source for the arts scene in New Jersey operated by writer Jay Lustig, helped to spread the word about “From the Heart” in a post you can read HERE. Find out more about “From the Heart” at my brother’s website, Vogerland.com. Here’s the “From the Heart” house band— Brinie, JohnYoung and me, a.k.a. Scream — joined by the dean of electric guitar, “Mean” Dean Gallagher, playin’ that legendary Long Branch nightspot, the Brighton Bar, in 2010. (Our three-song set list: “Wicked Ways,” “Little Girl” and “Love Me or Leave Me.”) At the time, we were hot ‘n’ heavy workin’ on “From the Heart.” P.S. : Yeah, there’s an American punk band called Scream that made it, but our Scream took the band name first, in 1974. They toured America and Europe; we played the Almonesson Ballroom.